Dana Ellyn is a DC resident and full-time painter who lives and paints in her studio in downtown Washington, DC. Ellyn committed herself to full-time status in 2002 when she decided to leave her corporate job and pursue painting. She graduated from the George Washington University with a degree in Art History and Fine Art in 1992. She has exhibited throughout the United States and abroad, most recently in Baltimore, Maryland; Barcelona, Spain; Norfolk, Virginia; Casablanca, Morocco; Westhampton, New York; Louisville, Kentucky; and Washington DC. The paintings of Dana Ellyn embody a fearless self-exploratory manifestation of modernity. Collected internationally, Dana’s sly humor and painterly skill entice the viewer to re-interpret the zeitgeist. Meats oozing red liquid, tendons, skinned creatures stretched-out in a deli case. These images formed the nightmares of artist Dana Ellyn's childhood. 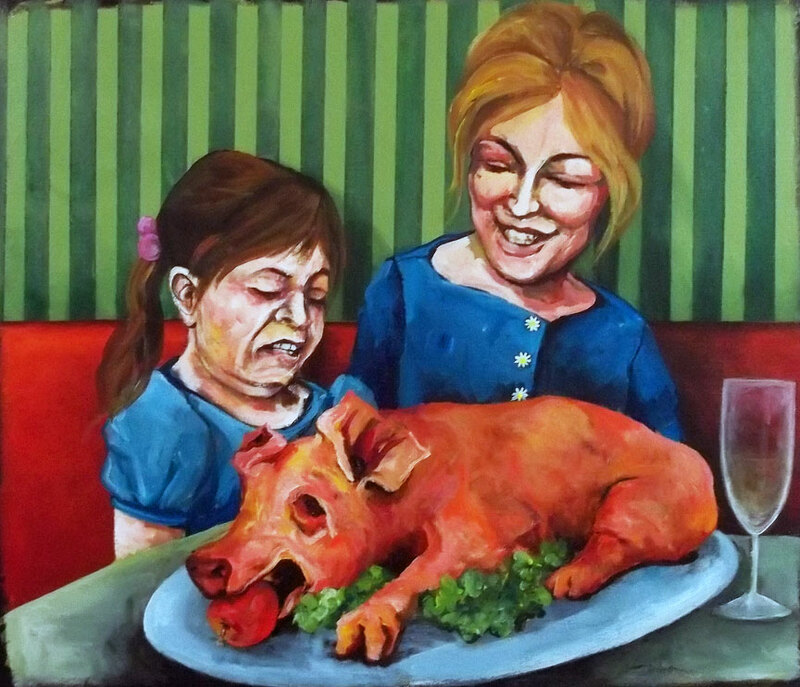 Today, separated by the distance of years and a vegetarian diet, Ellyn's paintings lend a darkly humorous twist to the subject of our consumption and use of animals. Ellyn invites viewers to reconsider the every day. Pieces give a new meaning to ubiquitous phrases, lending a comically sinister meaning to "baby back ribs" and turning "pig in a blanket" on its head. I met Dana at the Anti-Fur Conference in Virginia in May. She took some time out to tell me what some of her paintings mean. This painting expresses how I felt as a kid. Looking back, I realize I've been a vegetarian at heart since a very early age. Meat always bothered me. If I had to eat red meat, it had to be well done. Any sign of oozing red liquid was a deal breaker. And chicken on the bone was a big problem - because it still looked like an animal. And don't even get me started about the tendons in a chicken wing. Or gnawing the meat off of a spare rib at a Chinese restaurant one night and realizing this is some animal's rib! 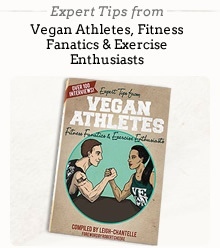 I wasn't aware that not eating meat was an option when I was a kid. My work-around was to chop everything in to very very small pieces and inspect each piece thoroughly on the end of a fork before putting it in my mouth. If the piece of meat was too big and I had to chew it too long, I would sometimes gag and have a hard time getting it down. I'd often spit things out in my napkin. Thankfully, my mother always cooked certain meats and side dishes together. So I minced my pork chops and suspended the shreds among my Rice-A-Roni. I crumbled my meatloaf and mixed it in to my Velveeta mac & cheese. Both An American in Paris and Deli deal with how different cultures and different countries eat different animals. To an American, cows and pigs are thought of as food. Bunnies and kitties are cute fluffy things we keep as pets or enjoy watching prance through our grassy backyards. When traveling in France, I saw delis full of 'lapins' (rabbits). My high school level French vocabulary not being what it used to be, I didn't recognize the word "lapin" right away. And the bright red skinned stretched out creatures I saw stacked in the case didn't resemble any animal I could place right away. Then I realized, rabbits. Oh my. When I went to China, I encountered a man selling little tiny kittens on a side street. Let's just say it was obvious they were not meant to be pets. As a vegetarian, the sight of any dead creature in a deli case is icky. But of course I'm somewhat desensitized to the countless chickens, fish, beef and pork products I've seen my whole life. It's examples like this that lead to these 2 paintings. 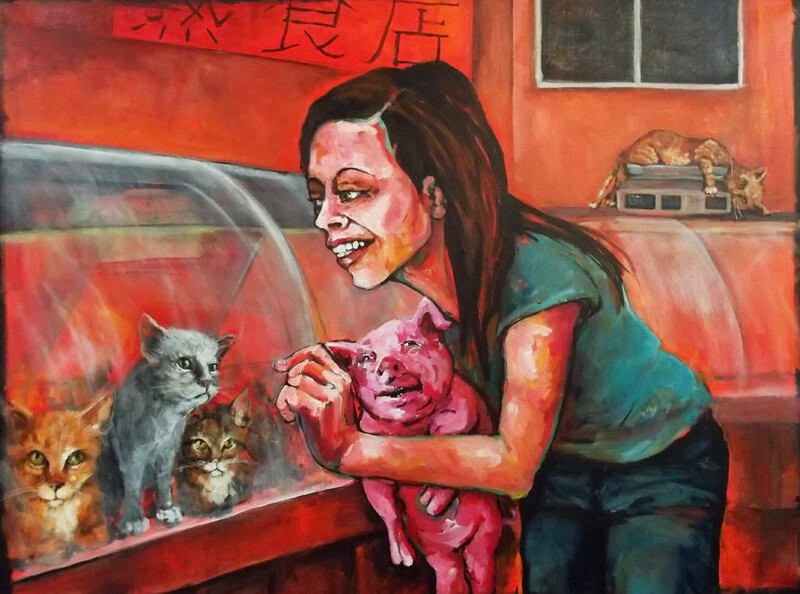 It's been interesting to show these painting to meat eaters and see their reactions. 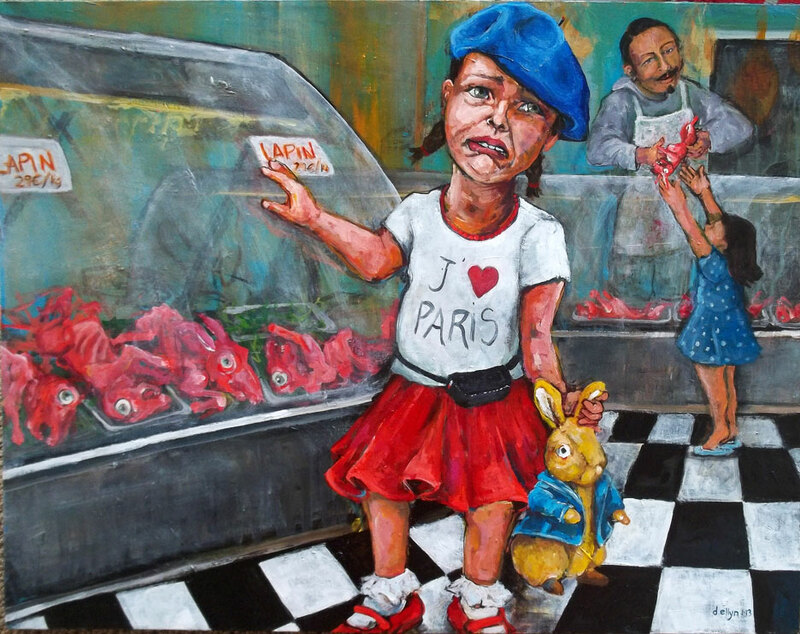 Someone who eats chicken/beef/pork without any qualms gets all sentimental when they see the rabbits and kittens being sold for food in my paintings. On an intellectual level they understand my reference that it's about cultural differences. But they aren't able to turn the mirror on themselves and fully admit that what their eating is no different. Americans tend to be very removed from the source of their food. They purchase meat that is neatly packaged under plastic wrap that often bares little resemblance to the animal from which it came. I have had many conversations with people over the years about being a vegetarian. When I talk about the horrible conditions of factory farms and ask people if they've ever watched any of the videos on them, they shake their heads and always claim that they 'know but they don't want to know'. They basically admit that if they admitted to themselves how awful it is, they would have to stop eating meat. I don't get that. So why not just stop eating meat instead of sticking your head in the sand and pretending you don't see the problem? 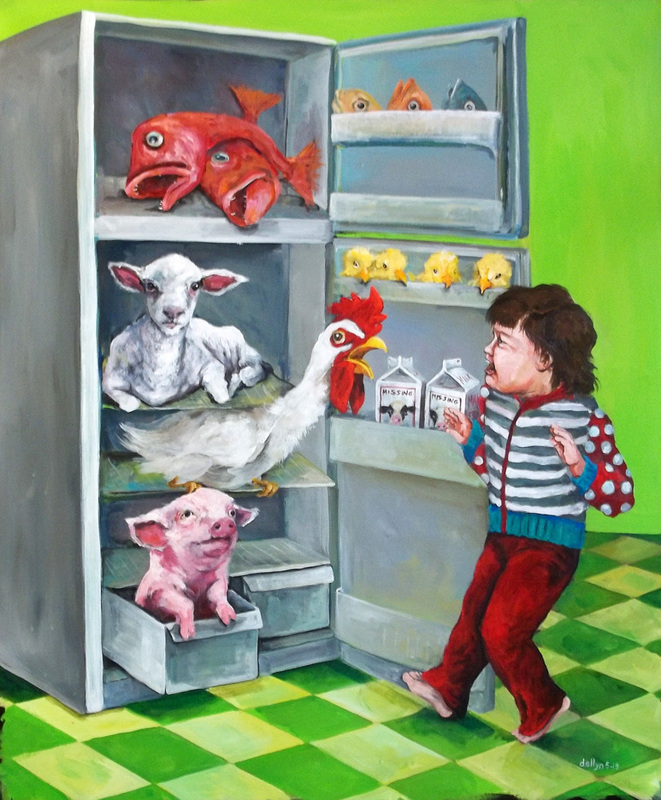 In "Meet Your Meats" I have envisioned a scenario where someone would open their fridge to grab lunch and have to deal, face to face, with the animals they are considering dining upon. Pigs are smarter than dogs. Lots of people may have heard this fact in passing but don't really take to heart the implications. I wonder if more people took the time to hang out and get to know a pig as a pet, would they ever be able to eat them again? I suppose some people would and some wouldn't. In Outsmarted, a pig has pulled off a great caper. He outsmarted the family dog - putting him in a pig costume to be served up for dinner while he sits slyly in Fido's bed looking on. 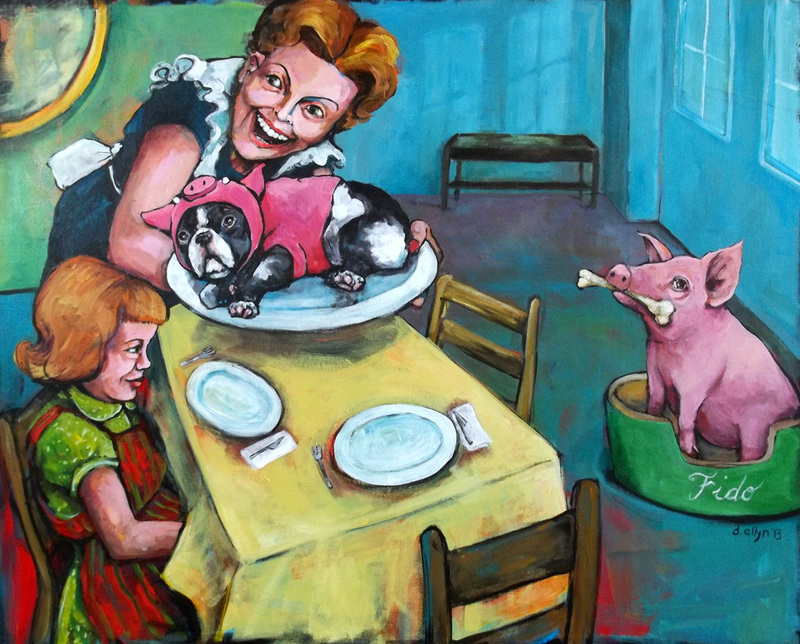 The young girl seems to know what has happened because she's looking in the direction of the pig, suppressing a smile. But mom (very purposefully represented in a 1950's era style) is dutifully serving up dinner. Traditional and old-fashioned, she doesn't question anything - she is just doing what's expected of her.